Focus Type. Optic/Glass: very slight haze can be seen through a strong LED light, but won't affect imaging! Pictures of the actual item. what you see, what you get! Optic/Glass: No scratches, No haze, very slight fungus when see it through a strong LED light, but won't affect imaging! Tiny scuffs from normal use. ■ Functional. Of course, there is no problem in the shooting. - No separation. Inside the lens had been inspected with LED light. I send a product by EMS. serial number:6667887. No problem or impact when taking photos. Hasselblad 50mm CFi lens in good working order and excellent condition as pictured. The glass, aperture blades, and body are in Mint condition as shown. The lens has seen very little use, and is in like new condition. 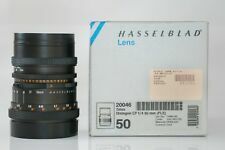 Hasselblad 50mm CF FLE lens in good working order and excellent condition as pictured. The glass, aperture blades, and body are in Mint condition as shown. The lens has seen very little use, and is in like new condition. Mount Type: For Hasselblad 500 Series. Lens is fairly clean. It has a few tiny dusts. There are thin haze (like very tiny dots) on inside of the lens. ◆Appearance. [For Parts] Restoration required, parts may be broken or missing. The lens was repaired and cleaned by Japanese professionals. This lens is in mint- condition. It has no affect on image results whatsoever. You should expect everything to functionreasonably well, and that optics have no problems that would noticeably affect image quality and results, unless we describe them otherwise. Focal Length: 50mm. The appearance is very beautiful, even with emphasis on appearance. I can not see Sure Atari Hekomi. The lens wipes back and forth inside and out of the ball, and it is very beautiful. Hasselblad HC 50mm f/3.5 lens. Here is a Hasselblad HC 50mm f/3.5 lens. For Hasselblad. Does not apply. Pictures of the actual item. What you see,what you get! The lens ideal for landscape, architectural or press photography but suits a wide range of other subjects. It is an incredibly sharp lens, wide open. Focus ring: Smooth all the way through. - There isNo balsam separation. Focal Length: 50mm. The lens barrel of this era is easily scratched, but this individual is in a very beautiful state, and no noticeable scratching, threading, atari, hekkon etc. can be seen. Both the lens and the ball are very beautiful. Hasselblad C Chrome 50mm f4 Distagon T* #5592974 ............. Very Rare !! NO SCRATCH. WORKING PROPERLY. FLASH SYNC. ●Optics Condition for lens. [ Dust ] - Very little. [ Separation ] - No. ・Such as pictures. Maybe we can find it for you. WORKING CONDITION. OPTICAL CONDITION. SERIAL NO:6191150. The item in pictures is the actual item you will receive. Focal Length: 50mm. The lens wipes back and forth inside and out of the ball, and it is very beautiful. There are no problems affecting the shooting results. The shutter is fully released and no problem with the speed. ■ Total Near Mint ■ Serial No. 7264878 ■ Appearance Appearance is beautiful, A few scuff from normal use. *Please check photos. ■ Optics Beautiful condition. Optic/Glass: no scratches, no haze, no fungus! Focal length: 50mm. Our Products are 100% Authentic. Front Lens cap. Rear Lens cap. There is n o fungus. ◆Optical system◆. I send a product by EMS. 50mm f/4 T for 500 503 From JAPAN #176. I participate from Japan. So I can provide you the best service. It works properly. I send a product by EMS. ■ Serial Number. - No fungus. Hasselblad C Chrome 50mm f4 Distagon T* #5593422 ........... Very Rare !! Usefull Link. This Dust will no effect your picture quality. Functions: Works properly. Restoration required, parts may be broken or missing. Works okay, with heavy signs of use. Works okay, with signs of use. Near Mint! Condition Grade Near Mint. Near Mint It is used,but there are few sign of use. Mint It is used,but there are almost no sign of use. We clean every product carefully and confirm the function by loading a film and taking photo. Hasselblad C Chrome 50mm f4 Distagon T* #5305035 .......... Very Rare !! ,all speed working, very very faint front & internal cleaning marks(or just dirty),no haze, tiny dust inside. From Japan m048. Hasselblad Carl Zeiss. I will provide courteous and responsive service. I send a product by EMS.